The "What's This" pics are closeups of this turtle's shell. My simple answer to my own question is "Turtle." What type of turtle, you ask? I have NO idea, but s/he sure was a bigg'un! Turtle measured a full 14", stem to stern. 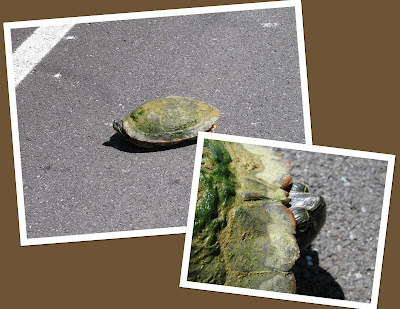 S/he was Very covered in algae, and heading across the road, towards the creek. We NEVER leave animals on the road if we can at all help it. Subsequently, this guy got a lift into the grass in hopes of allowing her/him to continue the journey. Can you ID my mystery turtle? ?